Princess Moana wants to surprise Boss Tui with a delicious birthday cake, but for this she needs our help. Let's decorate the best birthday cake that Chief Tui had. There are a lot of decorations to choose from! This fun game can be made from any device: Smartphone, tablet and PC. Dare and click to this exciting game making a delicious and beautiful cake for the boss Tui and all are amazed with your cake. 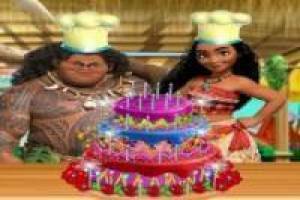 Enjoy the game Moana in the kitchen, it's free, it's one of our kitchen games we've selected.